Uelfbaby Walkers are made from a proprietary Thermo Plastic Elastomer or TPE that we routinely test to over 300% elasticity. The product should be fitted around the toe area of the footwear in no question and grasping just in front of the rear cleat, stretch the product toward the heel and position the heel straps on the heel cup of the shoe or boot above where the outsole meets the upper while positioning the rear cleat near the center of the heel of the footwear. Some users will find an easier time fitting the product when not wearing the shoe or boot onto which uelfbaby are to be mounted. Keep a pair on hand and Do not let winter catch you off guard. With Aggressive cleats and tread, Uelfbaby walker ice cleats provide unbeatable grip. The lite walker Rolls up nicely and is small enough to be carried in a purse or workbag. Ideal for city workers, postal carriers, delivery workers, and anyone that spends their days outside on their feet. The non-replaceable multi-directional steel cleats bite into ice and snow allowing you to stride naturally Through winter's worst conditions. Made from the same elastomer as the Uelfbaby sport ice cleats, the lite walker is Easy to pull on and take off, while securely fitting both shoes and boots. Full foot slip protection with heel and forefoot cleats maintains traction throughout your natural stride while walking. Lightweight TPE Elastomer holds Uelfbaby walker securely in place. Traction tread outsole and cleats simultaneously contact walking surface, Providing superior grip on ice, snow, and pavement. Multi-directional, heat-treated steel plates bite into ice and snow. MULTIPLE USES: Suitable Not Only For Outdoor Ice And Snow, But Also For The City To Use During The Snowy Weather, Particularly Suitable For The Elder and Kids. Reduce The Risk Of Jnjury From Slips And Falls When Walk On Ice, Snow, Mud And Wet Grass Or Other Poor Conditions. 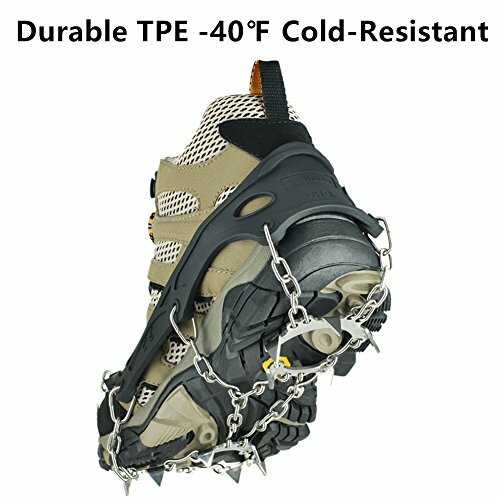 FIRM CONNECTION:High-strength steel spike-and-chain system provides excellent traction on a variety of icy surfaces, durable elastic harness ensures a tight hold on your shoe, even at cold temperatures.Ergonomic plate system for added spike stability. 100% Money back & satisfaction Guarantee - If you are not completely satisfied with our product within the first year, we will replace it with a new one or refund your money, no questions asked, Our Customers Matter! If you have any questions about this product by Uelfbaby, contact us by completing and submitting the form below. If you are looking for a specif part number, please include it with your message.